The humans of the Five Kingdoms and the elves of Xadia have long existed in an uneasy peace, their lands separated by a river of lava guarded by the King of the Dragons. Now human assassins have slain the Dragon King and destroyed his last surviving egg. Elven assassins have been dispatched to slay King Harrow of Katolis in retaliation. But one of the assassins, Rayla, finds herself forming an alliance with Crown Prince Ezran and his half-brother Callum when they make a discovery that could avert war and restore peace to the continent. 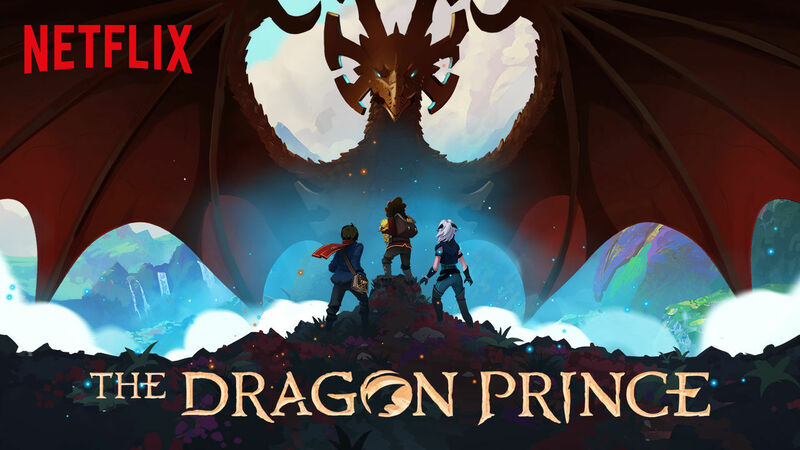 The Dragon Prince is a Netflix original animated series that comes with an impressive pedigree. Written by Aaron Ehasz and directed by Giancarlo Volpe, two of the main creative forces on Avatar: The Last Airbender, The Dragon Prince is aiming for that same action-adventure vibe with a cast of colourful, complex characters and a story that both adults and children can enjoy. In this respect the first season is a near-unqualified success. It’s funny and serious by turns, the voice acting is excellent and the characterisation is first-rate. The villains – if they can even be called that – are treated as human characters with their own foibles and strengths (and a sense of humour) and a firm belief that what they are doing is right. Even secondary characters, like the deaf General Amaya, are well-fleshed-out individuals. The show also has great music and effective worldbuilding, albeit of a slightly more traditional nature than Avatar: The Last Airbender and The Legend of Korra. The show does have two issues. The first is that the series employs a curious mixture of 2D animation and 3D CG graphics. The two styles don’t mesh entirely well, resulting in somewhat undetailed faces for some characters. Due to technical issues, some shots have also had to have their frame rates reduced, resulting in distractingly jerky animation. Fortunately this is only an occasional issue. At other times, particularly anything involving fast action or magic, the animation is gorgeous. The second issue is that nine 25-minute episodes is barely enough time for the show to clear its throat. The story is only really just getting underway, there’s a startling plot twist in the finale and potential new regular characters Ellis and Ava have joined the party, and suddenly it’s all over. Hopefully Netflix renew the show and put a second season on the fast track, because this is a more-than-worthy heir to Avatar: The Last Airbender, although it is not quite on the same quality level just yet. Season 1 of The Dragon Prince (****) is available to watch worldwide on Netflix right now. If it's a worthy heir to ATLA and so amazing, why do you have little to say about it then? My biggest surprise of the year so far, one of the best shows I've seen in a while. Adored everything about it.